This utility displays the details of all Winsock service providers installed on your system. For every Winsock service, the following information is displayed: Display Name, Status (Enabled/Disabled), DLL Type (32-bit or 64-bit), DLL Filename, DLL Description/Version, and Created/Modified Time. WinsockServicesView also allows you to easily disable/enable a Winsock service provider. Disabling a Winsock service may cause your network/Internet connection to stop working. You should use this feature carefully, and if something goes wrong, simply enable again the Winsock services that you previously disabled. On Windows 7/8/Vista/2008, you should right-click on WinsockServicesView.exe and choose 'Run As Administrator' in order to disable or enable Winsock services. Disabling a Winsock service provider is made by setting the 'Enabled' value to 0. 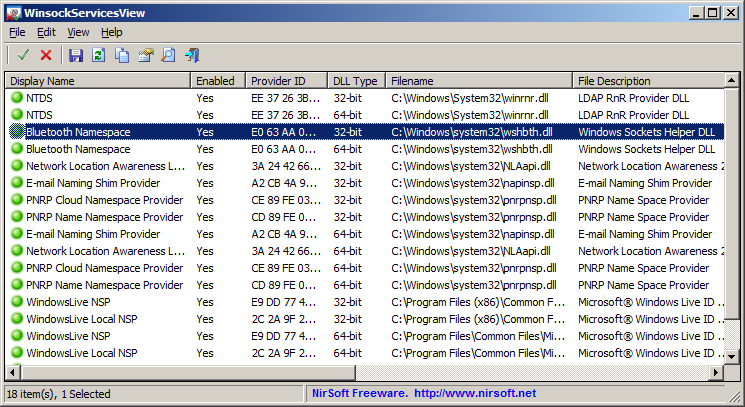 After running it, WinsockServicesView displays the details of all Winsock service providers installed on your system. In most systems, you'll only see the default Winsock services of Microsoft, which are installed automatically with Windows operating system. Generally, you should not disable the Winsock services of Microsoft and if you disable them, your network/Internet connection may stop working. If you see that there are non-Microsoft Winsock service providers on your system and you suspect that these Winsock services cause network/Internet problems, you can try to disable them and check if it solves the problem. /stext <Filename> Save the Winsock services list into a regular text file. /stab <Filename> Save the Winsock services list into a tab-delimited text file. /scomma <Filename> Save the Winsock services list into a comma-delimited text file (csv). /stabular <Filename> Save the Winsock services list into a tabular text file. /shtml <Filename> Save the Winsock services list into HTML file (Horizontal). /sverhtml <Filename> Save the Winsock services list into HTML file (Vertical). /sxml <Filename> Save the Winsock services list into XML file. A file named WinsockServicesView_lng.ini will be created in the folder of WinsockServicesView utility. After you finish the translation, Run WinsockServicesView, and all translated strings will be loaded from the language file. If you want to run WinsockServicesView without the translation, simply rename the language file, or move it to another folder. WinsockServicesView is also available in other languages. In order to change the language of WinsockServicesView, download the appropriate language zip file, extract the 'winsockservicesview_lng.ini', and put it in the same folder that you Installed WinsockServicesView utility.